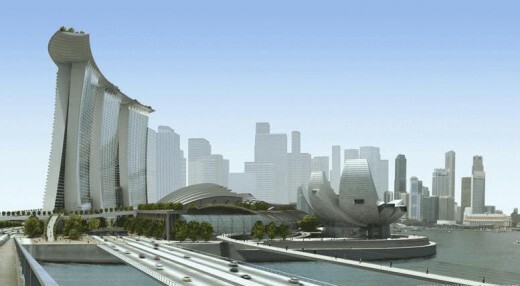 Marina Bay Sands is the world’s most expensive hotel, it’s boat-shaped ‘SkyPark’ perched atop the three 55 storey towers. This three towers are connected with a one hectare roof sky park offering 360-degree views of Singapore’s skyline and featuring beautifully sculptured gardens, restaurants and a swimming pool. The SkyPark will be home to the world’s longest elevated swimming pool, with a 475-foot vanishing edge, perched 200 meters above the ground. While the water in the infinity pool seems to end in a sheer drop, it actually spills into a catchment area where it is pumped back into the main pool. 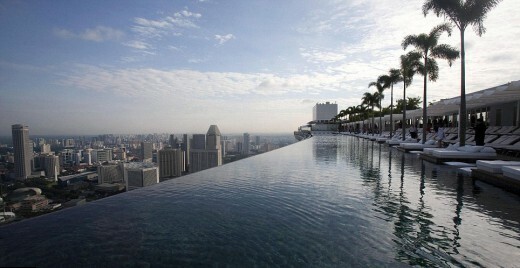 At three times the length of an Olympic pool and 650ft up, it is the largest outdoor pool in the world at that height.